When it comes to ‘greatest guitarists’ polls, Queen’s Brian May is certainly up there, usually in the top five, but not anywhere near recognised for his songwriting , and he’s pretty good at that too. All four members of Queen have had a hand in writing Queen songs, Freddie’s first sole writing credit was on their debut hit Seven Seas of Rhye, Brian’s debut solo effort was Now I’m Here in 1975, John Deacon shone in 1976 when he solely penned You’re My Best Friend and when Radio Ga Ga – Roger Taylor’s solo success – entered the chart in 1984 – Queen became the first band to have all members solely written a top 10 hit. Brian’s other successes were Fat Bottomed Girls, Save Me, Flash, Las Palabras De Amor, Hammer to Fall, Who Wants To Live Forever, We Will Rock You and today’s subject, Tie Your Mother Down. Brian was born in July 1947 in, what is now, the fictitious county of Middlesex. His first musical outing was in 1967 in a band called 1984, named after the George Orwell novel, with singer and bass player Tim Staffel. Within a few months Brian and Tim formed Smile and they recruited drummer Roger Taylor. In 1970, Tim left and Freddie Mercury, who had been trying for a while to get into the band, finally took over as lead singer. In 1971 John Deacon was recruited and Freddie renamed the band Queen. 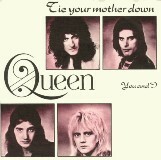 Queen’s first single, Keep Yourself Alive, died as did their debut eponymous album when both released in 1973. The following year saw Seven Seas of Rhye and Queen II both make respectable chart positions and EMI immediately re-issued Queen and it charted the week after Queen II. The parent album, A Day at the Races was, in looks, almost identical to its predecessor, A Night at the Opera – just a colour change and the addition of the Queen crest. Both albums were diverse and all four member were experimenting and pushing all boundaries. A Day at the Races was the first album produced by the band (Roy Thomas Baker had produced the first four) and the first single from is was Freddie’s song Somebody to Love which peaked at number two. Tie Your Mother Down was the follow up and featured John Deacon’s song You & I on the B side, however, in Japan, the B side was Roger Taylor’s song Drowse. The accompanying video was filmed during the rehearsals of their American Tour, in Miami with all four members in full pelt and Freddie prancing about the stage like a fairy God-mother. They were experimenting with new effects and one planned explosion actually blew Roger off his stool.